Licensing Magazine has revealed a number of licenses that Universal has awarded for some of their franchises. 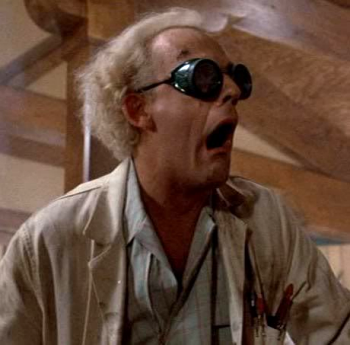 The biggest bit of news is that Mattel has been awarded the worldwide license to produce Back to the Future toys. This includes “Action figures, accessories and toy vehicles“. However, this will not include die-cast vehicles. Welly Die Casting was awarded the Back to the Future die-cast vehicle license. AFI has also received a statement from Mattel. Here’s where your excitement may become a bit tempered. So we won’t see anything until 2012. In the toy world, that can seem like forever. As more info becomes available, we will have it for you here. So hit the DISCUSS button and sound off on your thoughts. They've said nothing yet. Basically saying they won't be revealing anything until 2012. Crazy. I don't remember much of the movies though I did watch them quite a bit when I was young. Movie Masters Delorean is a MUST! lovin this news, hope we could get it in 3.75 but mattel seem to drop the ball at that size. was going to write a wish list but DarkArtist got it perfect. I know, this is heavy. But seriously, good news. It's rather ironic that Mattel already has some rights to the standard DeLorean, since they've just released a Hot Wheels version in the 2010 First Editions series (three different colors, to boot), but not the BTTF versions. Doubly so since Hot Wheels is one of Mattel's biggest and most successful toy lines and is all about die-cast cars. I personally would love to see a 3.75" series, especially if it means we get in-scale vehicles. Playsets would be nice too. I'd like a clock tower set that can convert from 1985 to 1955 to 1885 somehow. Also would like Doc's Garage from BTTF, a futuristic town square set from BTTF II and Doc's Workshop from BTTF III. Damn....2012. That is a long time. So we probably won't hear or see anything till late 2011? I do hope they keep the BTTF name on everyone's lips till then. Everyone might forget about it! Speaking of...I really want to get the Blu Ray that just came out. I just really hope they don't do the retro Mego-style dolls and call it a day. Thanks bigbawsmcgraw... I do what I can... I've actually been getting alot of flak from other websites about this, people saying it's a pipe dream and never going to happen or that the line will be a 6" line like MOTU and Ghostbusters.... but i hold out hope that Mattel will tackle this like Hasbro handles G.I. Joe and Star Wars and gives us our 3.75" BTTF collection. By the way a "must have" for any BTTF fan. Get the hillvalley patch for GTA Vice City and San Andreas on the PC. Awesome! 2012? why not now or at most 2011? it's still right under the 25th anniversary of Back to the Future.